What began as a humble Kickstarter campaign is now the first crowd-sourced, crowd-funded, action-sports movie to hit theaters. 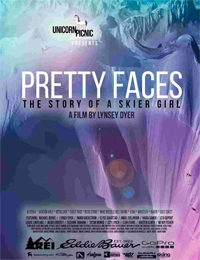 “Pretty Faces: The Story of a Skier Girl” was inspired by big mountain freeskier and Sun Valley native Lynsey Dyer. The film began a tour throughout Western ski resorts on Sept. 30. It will be screened at Sturtevants in Ketchum on Saturday, Oct. 4. Doors open at 6:30 pm. A fashion show will start at 7:30 p.m., followed by the film. “We are on a mission to make skiing and the outdoors look so fun that no girl will ever want to stay inside,” Dyer said in a news release. The film project raised almost twice its goal of $60,000. By the start of 2014, “Pretty Faces” garnered over $113,000 with over 1,000 financial backers. The idea for the project was born out of the gender inequality present in the skiing world—only 14 percent of ski athletes featured in films were female last season, the film’s Kickstarter page states, despite the strong female presence in the ski community. “We see this as an opportunity to provide an inspiring documentary ski film told from a female’s perspective to connect with and celebrate skiing’s female population,” the Kickstarter page states. The film is directed at the younger female population, because girls between the ages of 11 and 15 begin opting out of sports in large numbers, Dyer indicated. Dyer said she was inspired by her years as a professional skier and the cultural disconnect between talented female athletes versus recognition and ownership of the athlete title. The film’s plot isn’t limited to professional athletes, though. “The real story is the confidence that skiing can bring forth in a female’s life, no matter where in life that person may be,” the Kickstarter page states. Dyer and her production team encouraged video submissions for consideration into the film, as a nod to taking ownership of one’s ability and skill. Other female athletes featured in the film include Katie Rowekamp, Jayden Crist and Nadia Samer. Tickets are $15 (with beer) for adults and $10 for people under 18. The event will include a raffle and food will be available.